3am alarm, 6am flight to the Gold Coast, and in the water shooting before 8am on a clean 3ft morning at D-Bah // Tweed Heads on the NSW/QLD border. There is no better way to wake yourself up than jumping in the ocean and watching waves break overhead and surfers squeezing in a few fun ones before work. After a solid few hours, we treated ourselves to a coffee and an egg & bacon roll and watched the entertainment from the hill. The next morning I went to check out a spot called The Spit I came across from the previous arvo. This sand pumping pier had a cool structural influence on the otherwise typical beach scape, and getting lucky with the sun is always a bonus. Running along side the jetty was the sea way which looked interesting from above. The rest of the day consisted of exploring Surfers Paradise, both inland and beach side. Behind the bustling city on Main Beach, the local houses are built on and around the rivers and man made canals. These waterways are used just as much as roads connecting inner suburbia to the rest of the coast. Main Beach was unlike any other beach I had seen. To have a whole city, including sky scrapers, built into the dunes of this coast and endless beaches stretching in each direction creates some unique beach scenes. The busy morning was followed by a shoot at Straddie (Stradbroke Island) in some average surf conditions. As a photographer it is definitely possible to come up short and not capture the quality photos you're after. Although, getting out there regardless and shooting what the ocean throws at you is always fun and sometimes makes for some unique creative opportunities. Shark Bait // Straddie - Despite the murky water and long lulls, composing this shot with clouds forming far out to sea and sea gulls fishing just past the breakers kept me entertained, and kept the mind off the sharks. This morning's mission was to check out Burleigh Heads. Pandanus trees look out to waves breaking along the rocky point and the whole place has a very cruisy, laid-back feel. Unfortunately the clouds had rolled in and there was no more than a thin slither of orange at 6am while the sun rose. Not overly stoked with the clouds blocking the sun or surf conditions, it was back to bed and a cruisy day to catch up on editing. On a mission to find waterfalls and views, we drove out to Mount Tamborine national park just 30mins inland from the Gold Coast. After walking through some thick bushland and navigating down a stretch of river we came across Cedar Creek falls. Later, we parked up back on top of the mountain and looked out over the valley as the sun set behind the hills. Oooo baby it was working!! Actually getting over to the surf spot is a bit of an effort. A lengthy paddle over the sea way on a surfboard is sketchy enough (as sharks love to hang out at these river mouths) so being loaded up with camera gear was a different story. To avoid being completely vulnerable to what swam below, I borrowed a bodyboard to paddle over and then it was just about getting to the other side as fast as possible. After a long session it was another long paddle back to civilisation and then a couple hours to cruise and sort out some editing. Still stoked on the high from the morning we went searching for a late arvo wave at Main Beach. This long stretch of beach is where the city literally meets the surf. With not a breath of wind we had small but very clean waves which were so much fun to be out in. Where the city meets the surf. After many hours and long sessions in the water, you have a very salty, very burnt but very stoked photographer. The final day was spent checking out Coolangatta. There were some unreal beach scenes at Snapper Rocks especially. Perfect 2 footers ideal for those out with a mal, the floating city on the horizon and locals loving life in the sun. If I didn’t have a flight to catch I thought I could have spent all afternoon cruising in this magical place. 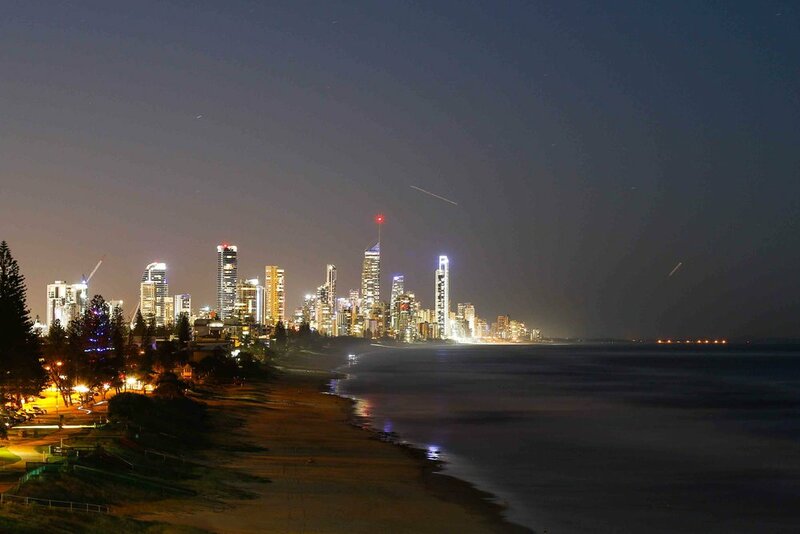 The floating city of Surfers on the horizon. Perfect arvo for a mal. Not a bad spot to be on duty. The lineup // Snapper Rocks. Cheers Gold Coast, you were unreal.